SharePoint Evil #3: Can’t view BCS External List: Unable to display this Web Part. To troubleshoot the problem, open this Web page in a Microsoft SharePoint Foundation-compatible HTML editor such as Microsoft SharePoint Designer. If the problem persists, contact your Web server administrator. A SharePoint Evil is an issue/error that is so ambiguous and misleading that Google will shows 50 hits, with 10 different suggested solutions, and none of them work for your particular case. (So the described below may not work for you – but I hope it will). In my case it was because of an error in the TypeDescriptors of my entity’s methods. A TypeDescriptor of the returnParameter of the ReadList method was meant to map to the Identifier, but it was not. It was set to (none). My entity looks like below, with the Identifier being CustomerID. The returnParameter for my ReadList method looks like below. 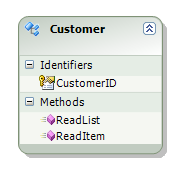 Setting the Identifier of the CustomerID TypeDescriptor and redeploying the external content type fixed the issue. Update: You also get this error if the property names of the C# entity class do not match up to the name of the TypeDescriptors. 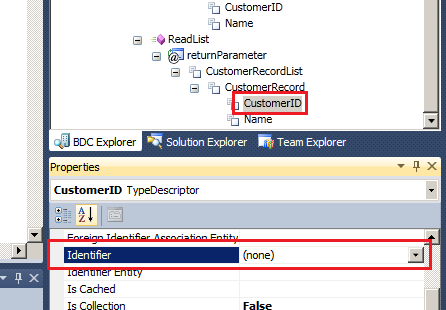 So in the screenshot above, the C# entity class must have a property called CustomerID. If I named it ID for instance, then I will get this error. This entry was posted in BCS, SharePoint 2010, SharePoint Evils. Bookmark the permalink.